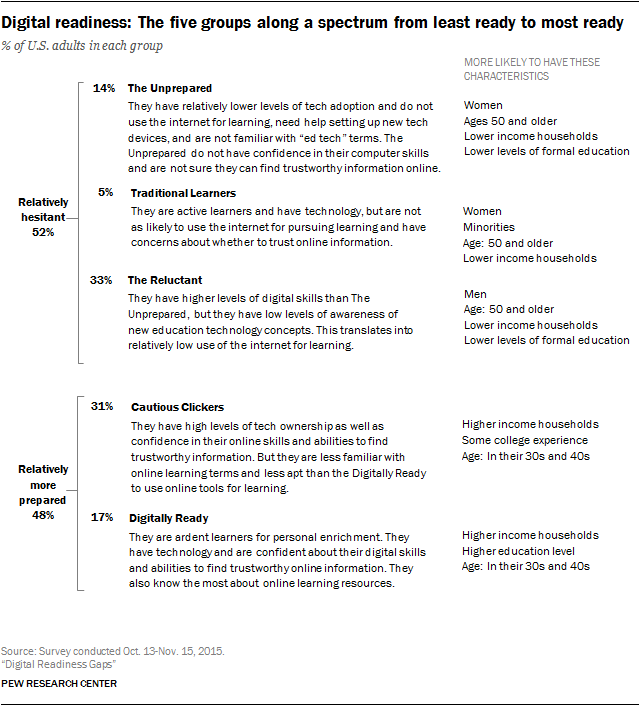 Is the digital divide growing or shrinking in the United States? A new Pew Research Center (PRC) report found that the digital divide, and digital readiness, is closely tied to an individual’s socioeconomic status, their race and ethnicity, and their level of access to home broadband and smartphones. PRC’s new report explores the attitudes and behaviors that underpin people’s preparedness and comfort in using digital tools for learning. For the report, PRC surveyed 2,752 adults, 18 years of age or older, living in all 50 U.S. states and the District of Columbia. Nine hundred and sixty-three respondents were interviewed on a landline telephone, and 1,789 were interviewed on a cellphone, including 1,059 who had no landline telephone. 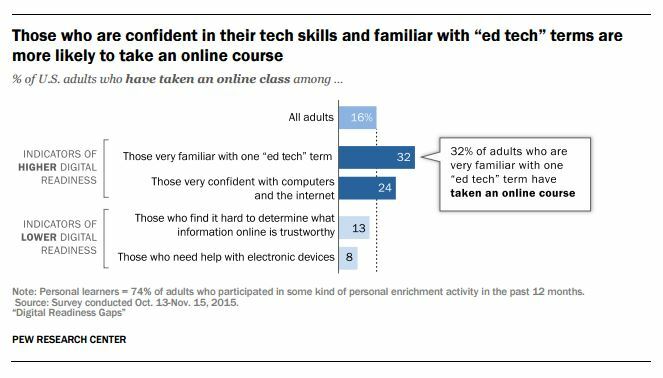 In the report, PRC attempted to assess respondents’ confidence in using computers, their ability to work with new technology, how they use digital tools for learning, their familiarity with ed tech terms, as well as their capacity to determine the trustworthiness of online information. The report notes that PRC’s findings solely cover people’s learning activities in the digital space, but don’t address the full range of what a person can do online, nor their readiness to perform such actions. information online and safeguard personal information. These two factors express themselves in the third dimension of digital readiness, namely use–the degree to which people use digital tools in the course of carrying out online tasks. PRC found that there were several distinct readiness groups among respondents–meaning most respondents were easily clustered along a spectrum of digital readiness. To assess a respondent’s digital readiness, PRC asked questions about confidence in using a smartphone, whether someone needs help setting up a new digital device, familiarity with ed tech terms (including Common Core Standards, Khan Academy, and distance learning), whether they have trouble determining if an online source is trustworthy, and if they’ve used technology for learning or taken an online course recently. PRC found that answers again followed the cluster pattern they initially found. 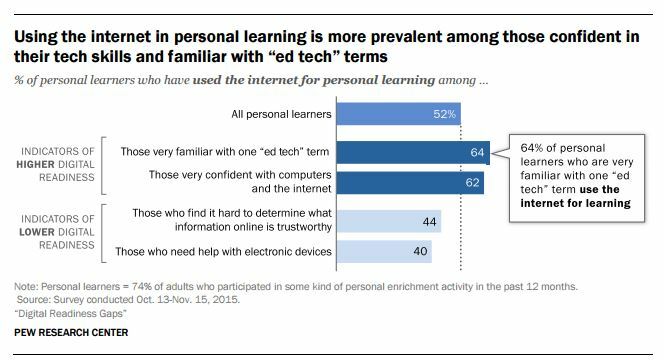 While the factors used to measure digital readiness clearly play a role in whether someone uses the Internet in personal learning, other demographic characteristics and access to technology also play a role. However, PRC’s new report challenges the previous notion that access to technology was all that was standing in the way of someone adopting a more digital lifestyle.